PLAYER PROFILE: Tyseanna Johnson brings a blue collar mentality to the court. She will not be out hustled or out worked on the hardwood. Johnson is a double-double machine, scoring and rebounds. She picks up a lot of hustle points around the basket and can win a game with mere determination. A 5'11" thoroughbred, the power forward is also a skilled baller with great footwork and nice offensive moves. Johnson can play with her back to the basket or she can face-you-up from the high post and go to work with sharp jab steps and pump fakes. She can catch and shoot ,or she can put it on the floor and operate. Johnson can also make things happen in transition and out on the perimeter. She has a formidable three-point-shot and her mid-range shooting is also good. Defensively her game is very polished. Johnson is very hard to score against, and she comes up with a lot of loose balls and is great at anticipating and jumping the passing lane. In her young career, Johnson has already earned a reputation as a big-time player, and she does it when it matters most, in March. As an eighth grader, Johnson led Minneapolis North to the Final-4 at the State Tournament, and last season she completed the journey at DeLaSalle High School with a State Championship (2010-2011 season). She also earned All-Tournament honors for her big-time performance at the big-dance. 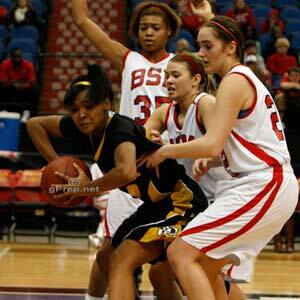 Johnson plays AAU ball for North Tartan 15's and is listed on HoopGurlz as one of the top players in the 2013 class.